Wash pumpkin, halve, and scrape out seeds with a spoon. Cut pumpkin into slices and then into large cubes. In a large grease-free frying pan, roast the pumpkin seeds over medium heat for approx. 1 – 2 min. until fragrant. Remove from heat and set aside. Peel and mince the onion and garlic clove. Wash sage and pluck leaves from stems. In a small pot, sauté sage leaves in coconut oil over medium heat for approx. 1 – 2 min. until crispy. Transfer to a paper towel-lined plate to dry. Then sauté onion in same pan for approx. 2 min. until translucent. Add cubed pumpkin to pot and cook for another 3 – 4 min., stirring occasionally. Reduce heat to medium, add garlic and dried herbs, and sauté for approx. 1 – 2 min. Deglaze with water, cover pot, and cook for approx. 5 – 7 min. until pumpkin is soft. Meanwhile, bring a large pot full of water to boil; add salt. Add pasta and cook until al dente, according to package instructions. When pumpkin is finished cooking, add almond drink and cashew purée to pot. Stir thoroughly and cook for another. 1 – 2 min. Remove pot from heat and purée pumpkin with a hand blender until smooth. Season with lemon juice and salt and pepper, to taste. 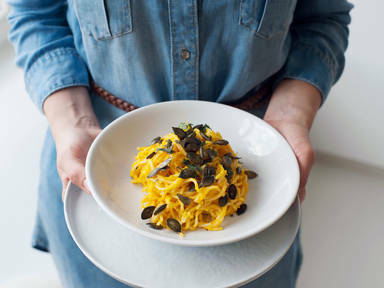 Combine pasta and pumpkin purée and mix thoroughly. Transfer to a bowl for serving; garnish with sage leaves, pumpkin seeds, and freshly grated Parmesan cheese. Enjoy!